New research shows that the ice sheet on Greenland contains the nutrient phosphorus, which was carried by the atmosphere across the country, where it fell with precipitation. Studies of the ice core drilling through the kilometers-thick ice sheet shows that there are differences in the amount of phosphorus in warm and cold climate periods. This new knowledge is important for understanding how the nutrient, phosphorus can be expected to flow into the Arctic Ocean when the climate warms and the ice melts and flows into the sea, where nutrients give rise to increased algae growth. 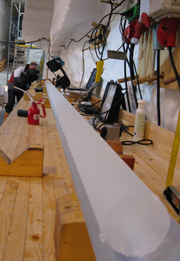 The results have been published in the Journal of Geophysical Research. Phosphorus that was in the oceans fell with precipitation and can be measured in the ice cores that are drilled through the more than 2½ kilometers thick ice sheet at the NEEM project in northwestern Greenland. Phosphorus is an essential nutrient for plant growth in nature and as a fertilizer for food production. 30 percent of all biological systems rely on phosphorus and nitrate. Nutrients that are not taken up by plants can get washed out into streams and further into the ocean. In addition, phosphorus from the atmosphere is carried to the deep seas, far from land, in the form of precipitation with dust particles. When the sun heats the ocean, some of the water evaporates and rises up into the atmosphere, forming clouds. The clouds can reach an altitude of up to 15 kilometers and they disperse across the entire globe. When the clouds fall as precipitation, it also contains some of the substances, for example, the phosphorus that was in the ocean and this can be measured in the ice cores that are drilled through the more than 2½ kilometers thick ice sheet at the NEEM project in northwestern Greenland. Because the ice is formed by the snow that falls year after year and remains and is gradually compressed into ice, you can get information about past climate and the nutrient content of the precipitation. But the oceans are not the only contributors of phosphorus. On Earth, there are sometimes great storms that blow dust from dry areas up into the atmosphere, where it spreads across the globe and falls, including on Greenland. The dust also contains phosphorus. 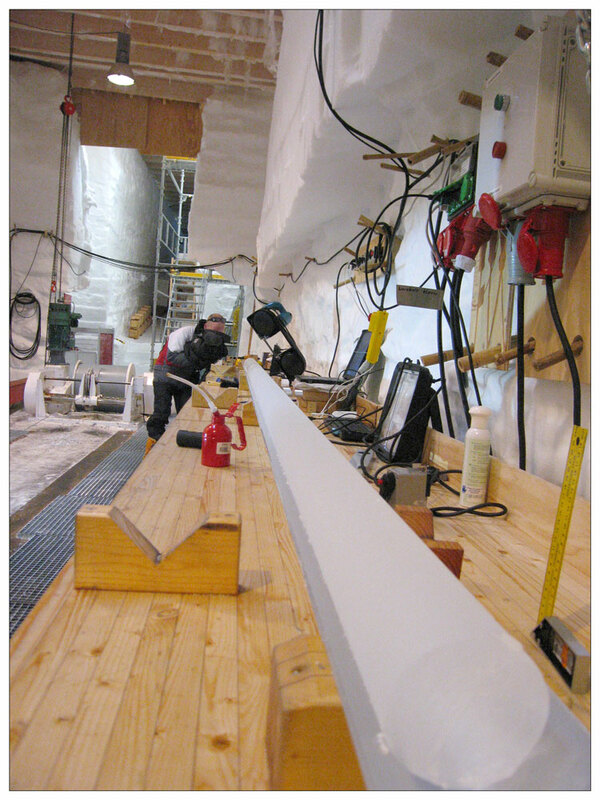 Everything that comes down from the atmosphere can be measured in the ice cores. 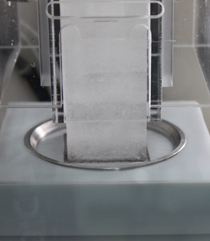 The ice core is melted on a hot plate. From this point, the melt water is analysed for its phosphorus and phosphate content. The stripes in the ice show different climatic periods with a lot and very little dust. 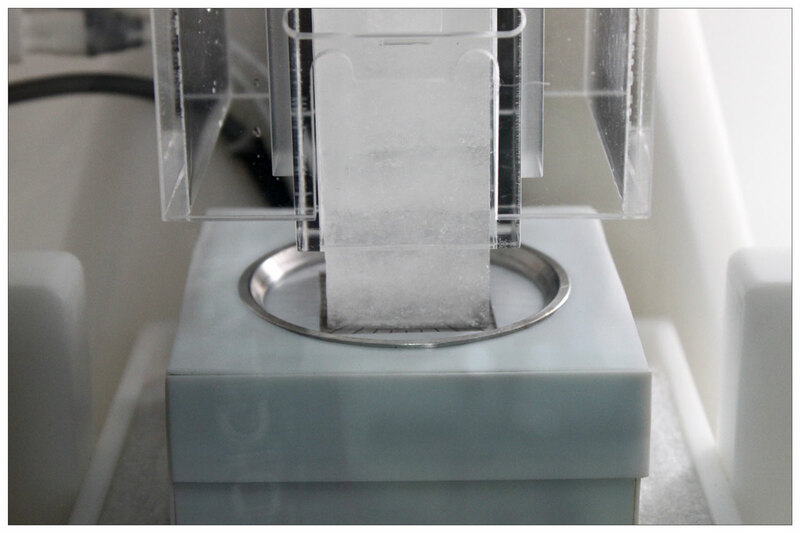 “We have analysed the ice from different periods between the ice age and the present. We look at what the total content of phosphorus is and how much of the phosphorus is comprised of the special ion PO43- - called phosphate, which is biologically soluble. Both the amounts of phosphorus and the ratio between the two variants, phosphorus and phosphate, tell us something about the atmospheric transport of nutrients,” explains Helle Astrid Kjær, a postdoc at the Centre for Ice and Climate at the Niels Bohr Institute at the University of Copenhagen. The last ice age lasted about 100,000 years and ended about 12,000 years ago, but there were great variations in temperature during the ice age. The analyses show that the amount of phosphorus was greatest during the glacial maximum about 25,000 years ago and they discovered similarly high levels in other cold periods, while the warm periods during the ice age had 10 times lower the content of phosphorus. 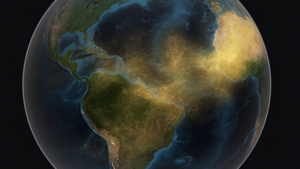 “Much of the phosphorus we find in the cold periods is linked to the dust that comes in from the large dust storms. We can see this because it primarily involves the form of phosphate that is not as biodegradable,” explains Helle Astrid Kjær. The researchers found high levels of phosphorus in the atmosphere during cold periods and lower levels in the warm. But they can also see that when there are large volcanic eruptions spewing tons of ash and sulphur far up into the atmosphere, then the atmosphere becomes more acidic and then the phosphorus dissolves into the dust from the dust storms and becomes more soluble and thus more biologically available. You see this, for example, in connection with the large Icelandic Laki eruption in 1783 and in 1816 with the Tambora eruption in Indonesia. Measurements from the period 1770-1820 also show a lot of phosphorus, primarily the special ion PO43- - called phosphate, which is biodegradable. The phosphate is bound together with particles in the atmosphere from large forest fires, while the phosphorus comes from dust. “Measurements from 1930-2004, on the other hand, do not show large amounts of phosphorus and phosphate and this is very surprising, because we use a lot of manure and burn refuse, which can result in large amounts of phosphorus in nature, but it evidently has not reached northern Greenland in precipitation,” explains Helle Astrid Kjær. The nutrient content of the ice is important in a time when we are facing global warming that could mean that large parts of the Greenland ice sheet will melt and flow into the sea. Large amounts of nutrients could lead to an increased growth of algae in the Arctic Ocean. The research, however, which was done in collaboration with researchers from Japan and Italy, does not look alarming. “The amounts of phosphorus and phosphate we have measured are not high compared to the level we normally see in the ocean, but because the ice primarily melts in the spring and summer when the algae are growing and have already used much of the nutrients in the surface water, the level of melt water could lead to an increased growth of algae in the Arctic Ocean,” says Helle Astrid Kjær.